I'm brought to you today by the words tired and fuzzy headed! 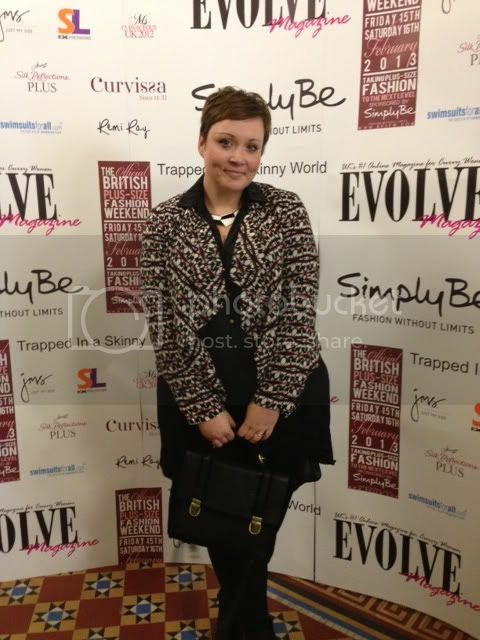 So, yesterday I left my house at 6am to head down to London for the British Plus Size Weekend, and after a very long journey I finally arrived in busy Shoreditch for the event, it was really great to see so many Plus Size women in one room, who quite clearly had a passion for clothes, and fashion. I went for the Zanzibar print jacket (which by the way had matching trousers but they didn't have them in my size in my local store and I didn't have time to order them! Gutted) I layered it over the oversized satin shirt dress (pictured below) I loved this dress it was so easy to wear and felt great,it also comes in orange and khaki, I'm very tempted to buy both! I finished the out outfit off with some sparkly boots which I comfortably wore for a good 8 hours, which fore, and heels is a massive triumph! It was really nice to spend the day with so many like minded women and catch up with some lovely bloggers, I'll be doing a little write-up over on the F&F Clothing Blog, so keep your eyes peeled for that, and as mentioned above, I'll be doing my own assessment on the day in another post. But for now, thank you F&F Clothing for giving me the opportunity to experience the event and making me feel fabulous in my F&F outfit! Looked better on you than the model. Looks really finished with that jacket. Really classy but very non frumpy look. Cute outfit and I agree it looks much better on you than the model. Greate Atricle I like your blog and Plz update it more I'll subscripble you & Your Looking Great.